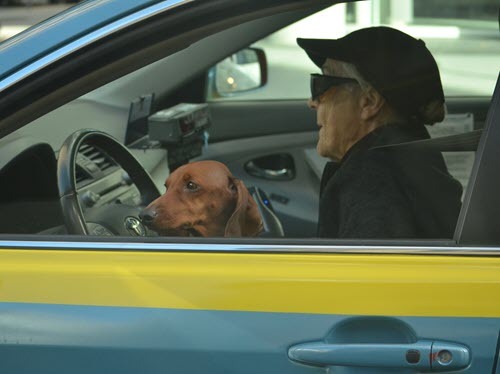 While this may seem precious – it is not a safe practice for the dog or the driver. Both animal and driver could suffer serious injuries. For many dog owners with a quick errand to run, it may seem like a no-brainer: Bring the pup along. Whether they’re sticking their head out the window to get a whiff of fresh air, or simply sitting and watching the new sights go by, many dogs love car rides. Before you buckle up for your next adventure, consider these eight dog car safety mistakes you might be making. Without any pet restraint laws in place, it might be easy to jump in your vehicle with your dog and drive off. But before you put your seatbelt on, consider what is keeping your dog safe as you drive. He recommends using a seatbelt made especially for dogs or a crate that’s secured to the seat. Keeping your dog secure in your car is the first step, but making sure the seatbelt or crate is installed properly is essential to preventing injuries. “A pet could suffer an injury from a harness or restraint either by the restraint not being properly fitted to them, the restraint being improperly sized, or restraints not being adequately secured in the vehicle,” says Dr. Sabrina Meldrum with Vetted PetCare in California. Be sure to read the instructions before securing your dog in the car, no matter how simple the device looks. As a dog owner, you know that certain foods, like chocolate and sugar-free gum, can be harmful to your pet. If there’s an item in your home that would be harmful to your dog, it can be harmful in the car, too. Non-food items that people keep in or near their cars, such as cleaning products, air fresheners, engine oil, and antifreeze, can also be toxic to dogs, Meldrum warns. Keep all car maintenance and care products out of reach of your pet. You might enjoy the company your dog provides when he is right beside you on long car rides, but consider what would happen if an accident occurred. Even secured dogs are safer in the back of the vehicle than the front, Steep says. “Front seat air bag deployment is not designed to protect small children or pets,” he says. In Michigan, where Streep is based, a proposed bill might make it illegal for people to drive with a dog on their lap. “I don’t think there is anything inherently wrong with the proposed legislation, but I’m not sure we need legislation when education might better serve the issue,” he says. It can be tempting when your dog seems to enjoy it so much, but avoid rolling down the car window to let Fido have a whiff. “If you were a dog, the breeze and the rush of new scents entering your nostrils would be an absolute delight,” Steep says. “Nevertheless, this is not a good idea. There is serious danger to the face, specifically the eyes, from flying debris.” He recommends rolling down the window a little, but not enough for your pup to stick his head out. Most dog owners have heard the dangers of leaving a dog in a hot car, but the consequences are real enough that it bears repeating. “Never, ever leave your pets in the vehicle in warm or hot weather,” Streep says. The same goes for cold weather. Hot weather can pose heat stroke risks for pets, while cold temperatures can cause hypothermia and frostbite. Your car can quickly become too hot or too cold, putting your pet at risk of serious health complications and even death. It might’ve been a common practice many years ago, for both humans and dogs, but letting your dog ride in your truck bed is never a good idea, Meldrum says. And don’t think that securing your dog in a truck bed makes it any safer. “In the open bed of a truck, even pets secured to the vehicle with a lead or harness of some kind have either attempted to jump or become jarred from their restraints, leading to potentially life-threatening injuries,” she says. Your dog may not be enthusiastic about a trip to the vet, but even a car ride to somewhere enjoyable like the dog park can cause stress and anxiety in some animals. “Traveling can be stressful to pets,” Steep says. “The noise and motion are unnatural.” He suggests covering the crate or carrier in the car, and talking to your veterinarian if your dog suffers from motion sickness or anxiety. FCVC vets are always happy to talk to you about your pet and the stress of traveling and make suggestion how to help your pet travel with you in safety. We wouldn’t want either of you to be injured. Give us a call at 970-587-5140. Related articles you may find interesting are Study Says: Almost Half of Pet Parents Do Not Have Car Safety Gear for Dogs and Lost Dog! Oh, no! But Wait, Is He Microchipped?